Shelving units are sold with shelf capacities - but what is the total unit capacity? A few years back, we had a customer who asked us to quote a good amount of rivet shelving (you might call it particle board, boltless, or by a brand like RiveTier or Penco’s Rivet Rite). It was a good sized project and that customer ended up buying it used from another company. He was happy with it right up until it collapsed and dumped hundreds of bins of aerospace components to the floor. The problem? He was storing something very heavy on either a shelf or on a post that couldn’t handle it. Once one of the shelves buckled, it set off a chain reaction that was kind of like dominoes and a whole lot of shelves went down. The components were similar looking, except for sizes, and it was pretty much a total loss. A higher capacity shelf is going to work even if you never get close enough to its limits to matter. But if you’re storing paper, metal or hardware — heavy, high-density stuff — you need to pay attention to more than the shelf capacity. For instance, changing the number of shelves affects the capacity of a shelving unit. If you buy one that’s got sufficient capacity and four shelves, you lose capacity by taking one out. Shelving units with fewer shelves, spaced farther apart, decrease the capacity of the posts (pallet racks act quite similarly). Adding more shelves increases the capacity of the posts, but only to a point. It is possible to add more shelves than the posts can carry. So if you decide to remove a shelf to accommodate a large load, you might have just reduced the capacity of your shelving. If you aren’t sure, err on the side of caution. Call us, and we can help you. When you consider the weight capacity for your situation, you need to consider the capacity of the shelf, the posts, and the decking material. Changing the number of shelves affects the capacity of the shelving unit. Units with fewer shelves, spaced farther apart decrease the capacity of the posts. Adding more shelves increases the capacity of the posts–to a point. 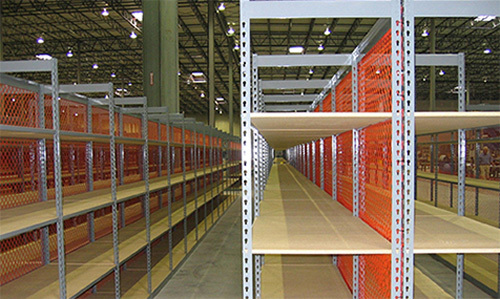 It is possible to add more higher capacity shelves than what the posts can carry. Overloading the posts can cause failure of the shelving unit. Overloading the posts can cause failure of the shelving unit. Even if you don’t remove a shelf, some very high capacity shelves can be placed on uprights that can’t support them. We list that stuff on our rivet shelving pages, but not everyone does, so be careful with that. Also, lighter capacity decking materials can also reduce the effective capacity of the shelving unit. Most shelving listed takes only the steel frame into consideration. Combine that with inadequate decking materials and you could have a collapse. In the end, shelving is pretty simple, and if you keep these capacity issues in mind when you’re specifying, and if you err on the side of higher capacities and narrower spans, you shouldn’t have issues.